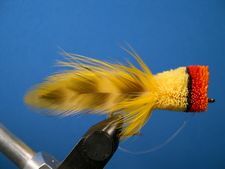 This is the way that I tie Dave Whitlock's Yellow Red Head. 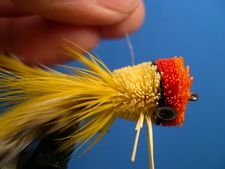 The other Red Heads - Orange, Roach, Green, and White are tied the same way by following the Red Head Yellow tying instructions. Clamp the hook in the vice, crimp the barb, and start the thread slightly forward of the hook point. Wrap the thread one-third of the way down the bend. 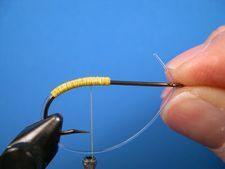 Reverse the thread and lay down a base of thread to exactly 3/16th inch forward of the hook point. Measure if you aren't sure. I do. Cut a three - inch piece of 17# weedguard material and align the front of the mono with the front of the existing thread wraps. 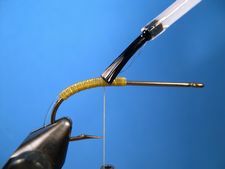 Bind the mono to the shank covering it and the entire thread base with tight wraps as shown in the photo. Size the weedguard now so you don't have to size it later when deer hair may get in the way. Insert the tag end through the eye, adjust it to the appropiate size, and kink it. Flatten the kink with needle nose pliers and cut the excess. Coat the thread wraps with thinned Dave's Flexament that's thinned almost to the consistency of water. 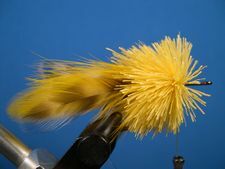 Prepare a marabou plume so that the bunch of fibers is about one and one-half times the hook length. 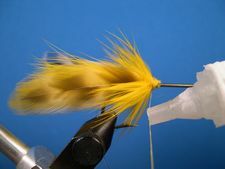 Trim the butts and align the trimmmed end of the marabou fibers with the front of the weedguard. 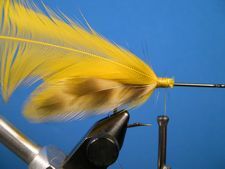 Bind the marabou fibers with close tight wraps as shown and return the thread to the hook point. 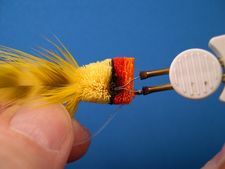 Attach one set of feathers to the far side of the hook with four or five wide spirialing wraps from the hook point to the front of the weed guard. 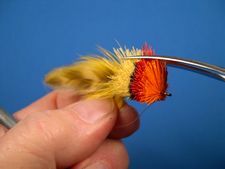 Return the thread with wide wraps back to the hook point and add the second set of feathers to the near side of the hook following the same procedure. Make sure that the tail feathers are straight. Adjust them if necessary. 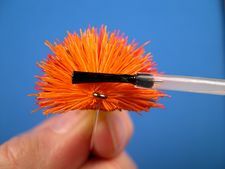 Then coat the thread base with thinned Dave's Flexament and cover the tie down area with tight wraps from the hook point to the front of the weedguard. Return the thread to the hook point. 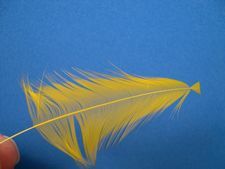 Select an approprite hen neck feather for the skirt and prepare it as shown. 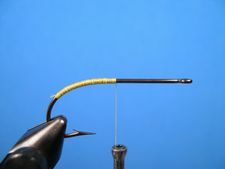 When the skirt is wrapped the barbs should extend slightly past the hook bend. 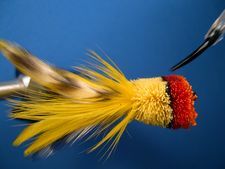 Tie in the feather by its tip with the curved side facing the hook and bind it down with tight wraps to the front of the weedguard. Let the thread hang there. Wrap the feather forward. 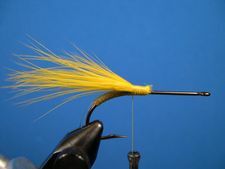 You may have to add an additional feather to cover the existing thread wraps between the hook point and the front of the weedguard. To finish the skirt tie it off with a ZAP-A-GAP knot. Simply coat about an inch of the thread with the glue and make 4 or 5 wraps on top of the existing wraps. Remove the thread after the glue dries, which only takes a few seconds. 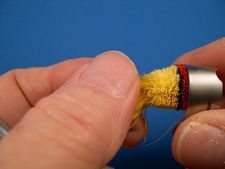 Attach Flat Waxed Nylon thread to the hook shank as shown in preparation for spinning the first bunch of deer hair for the head. Clip a bunch of deer hair from the hide that, when compressed, is the thickness of a lead pencil. 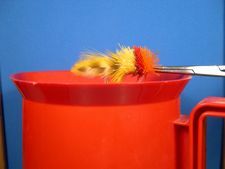 Clean out the underfur with a comb and trim the butts and tips so that you end up with a bundle at least an inch long. Spin a clump of hair onto the hook shank and take two or three tight wraps of thread plus a half-hitch at the base of the hair. 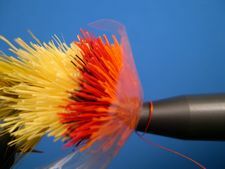 Pack the hair tightly as shown with a hair packing tool. 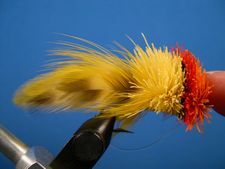 I prefer the Brassie Hair Packer shown in the photo. 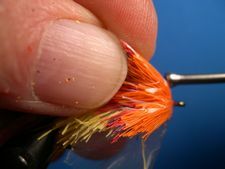 Move your tying thread forward three or four turns and spin and pack a second pencil sized bunch of deer hair the same way that you did the first bunch. 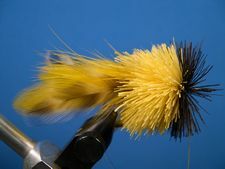 Move your thread forward three or four turns and tie in a bunch of black deer hair that's about half the thickness of a pencil and spin and pack it the same way that you did the other bunches. Move the thread forward three or four turns, prepare a pencil sized bunch of red deer hair and spin and pack it as you did the other bunches. Move the thread forward. 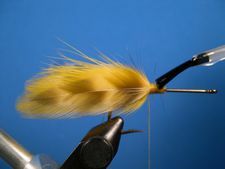 Prepare a clump of orange deer hair to finish off the head. 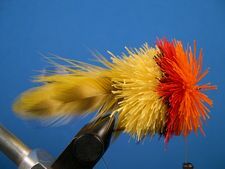 Spin and pack the orange hair the same way that you did the other clumps of hair. There should be no room left for hair at the front of the hook. If there is, just add a little more orange hair. 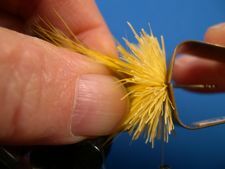 Tie off the thread with a couple of half-hitches or a whip finish. Now the fun starts. Your deer hair bug is ready to be trimmed! Remove the bug from the vice. Holding the bug with its belly up and the tail and skirt protected by your fingers, begin to trim a path with your curved scissors down the center of the fly from the front to the back. Continue removing the hair with the curved scissors until the belly is flat. Put the bug back in the vice. 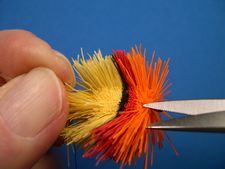 Poke a whole with your scissors tip into the center of a one-inch square piece of plastic bag and place it over the hook eye. Attach the 8/0 thread. Wrap the thread back against the plastic until the thread is as tight as it can be without the fear of breaking it. Insert the tag end of the weed guard through the hook eye and bind it down with a couple of thread wraps. Adjust the weed guard. 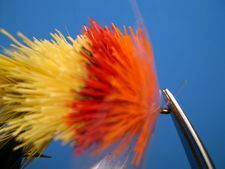 With your scissors trim the tip of the weed guard flush with the front of the hook's eye. Catch the tip of the weedguard with the thread and bind it down. Tie off the thread with two half-hitches or a whip finish. Remove the plastic by first slitting it with your scissors tip. Remove the hair bug from the vice. Clamp a pair of forceps onto the hook's eye and hold it over a "Hot Pot" of steaming water. The Hot Pot is what college students keep in their dorm rooms to heat up water for soup, coffee, or cocoa. Put about an inch of distilled water in the bottom of the pot before you plug it in. 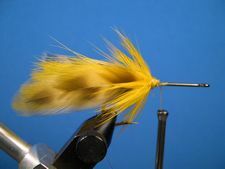 Steam the bug until the hair is standing at a right angle to the hook shank. You can see the bug grow before your eyes as the steam stiffens the hair. Don't skip this step. It makes trimming the hair bug so much easier. Remove the bug from the steam. Before the bug dries, flatten the face with your fingertips. You can either return it to the vice to flatten the face or hold it. The bug will be dry enough for the next step in a minute or so. Coat the face of the bug with thinned Dave's Flexament. 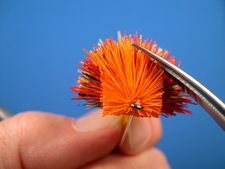 It takes about thirty minutes for the glue to dry, but you can speed the drying time to a couple of minutes if you blow-dry the bug with a hair dryer. After the Flexament has dried, trim the bugs face so that it's one-half inch square and rounded at the top. Measure the face with a ruler to be sure it's a half-inch square. I do. Use your curved scissors for this job. 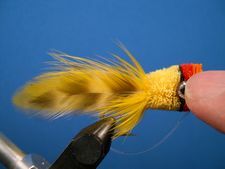 Using the face as a guide for your curved scissors take small snips of hair to rough trim the bug's body. The final trim will come next. Once you are satisfied with the rough trim, you can begin the final trim. 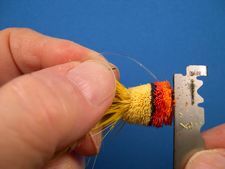 First hold the bug in an upright position with the tail materials protected by your thumb and fingers and trim the right and left sides from the front to the back with your razor blade, slightly tapering the bug's body as you go. 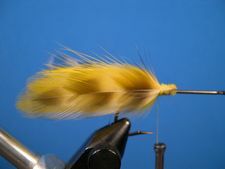 Then turn the bug over as shown in the photo and smooth the sharp edges on the bugs belly. To make two blades out of one, use a pair of household scissors to cut the blade in half length wise. Use the double-edged razor blade as a "bow saw" to round the top of the bug's body and slightly taper it from the face back to the skirt. As you're conducting the final trim, alternate between the razor blade and your curved scissors to do the best trim that you can. The scissors is especially handy in those places where a slip with the razor blade might remove more materials than necessary. This is the way your bug should look after the trim is complete and before the eyes and legs are installed. To install the eyes you can either burn or cut eye sockets. If you cut the sockets, use the tips of your scissors. I prefer to burn the sockets with a burning point as shown in the photo. If you burn the eye sockets, clean the burned hair out of the socket with your bodkin or a round toothpick. 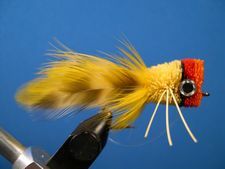 Turn the bug on its side as shown and liberally coat the eye socket and the area just behind it where the legs will be installed with thinned Dave's Flexament. Turn the bug on its other side and repeat the process. Put a dollop of Household Goop in each eye socket. This is best accomplished with a round toothpick. You can purchase Household Goop at any hardware store. Quickly pop an eye into each eye socket. 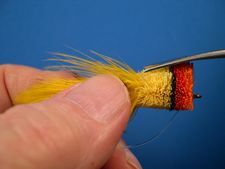 Sew three strands of small living rubber through the bug's body with a Whitlock Leg Sewing Tool. But before you do, make sure the glue that you applied in step 30 is dry. It takes a few hours for the glue to dry thoroughly. I often let my hair bugs cure overnight before I sew the legs. Directions for making the "Whtilock Leg Sewing Tool" can be found on the "At The Bench" page. 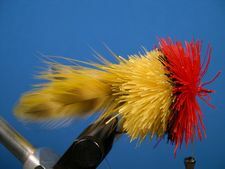 Your Yellow Red Head is finished and ready to be fished.